The Georgia Southern University Sexual Assault Response Team (GSU-SART) recently co-awarded Kristen Baker and Gemma Skuraton, MPH, the 12th annual Commitment to Advocacy Award for 2017. “The award is given to deserving members of the University community who have exhibited outstanding personal and professional contributions to promoting sexual assault awareness and education, as well as serving as an advocate for victims of sexual violence,” said Georgia Southern Counseling Center Executive Director Jodi K. Caldwell, Ph.D.
Baker, a senior sociology major, currently serves as president of the Sexual Assault Student Educators (GSU-SASE) and has demonstrated years of commitment to providing peer education to fellow students. She has assisted in planning and implementing sexual assault programming on the Statesboro Campus and has begun extending programming to the Armstrong Campus. Skuraton is a “Double Eagle” (‘12 and ‘14) currently enrolled in Georgia Southern’s Doctorate of Public Health program. She is the Health Promotions Coordinator in Georgia Southern’s Health Services and a member of GSU-SART. Skuraton has demonstrated a commitment to advocacy by implementing and assessing sexual assault programming such as It’s On Us week and Denim Day, among others. 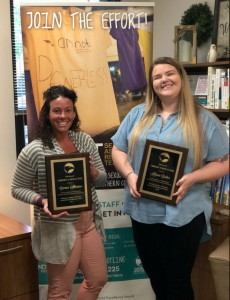 Both Baker and Skuraton serve as victims’ advocates at the Teal House Sexual Assault and Child Advocacy Center, a nonprofit organization in Statesboro that provides emotional support and advocacy for individuals who have been sexually assaulted.